Performance Mods! : S1W: Thunderslide, hi-flow, Buell Race ignition (6800rpm), Buell race exhaust, Penske shock. S2: T-storm heads/pistons, XB cams, Works shock. RIP May 2018, deer strike. Uly: homemade open inner airbox, heated grips, aux lights, CR mirrors. CR: removed passenger pegs, '10 LED taillight, heated grips. Problems/Miles (Please be specific): Dead regulator on S1W at 1200 miles (2006). Wrist pin rattle on S2 at 17,400 miles. Snapped Uly belt at 11,600 miles. Other Mods/Misc/Customization. : Assorted CF bits, LED signals with American Sport Bike flasher relay, LED brakelight w/modulator, Crossroads bars, CRG shorty levers, bar-end mirrors. S2 has "T" fairings, wide and narrow saddlebags, Banke frame brace. Uly has panels on all 3 bags painted to match barricade orange (home rattle-can match). CR has Uly pegs, '10 taillight, passenger peg delete and Buell touring seat. Favorite Rides (Roads and Routes): Anything clean and twisty. Or muddy and twisty on the Uly. 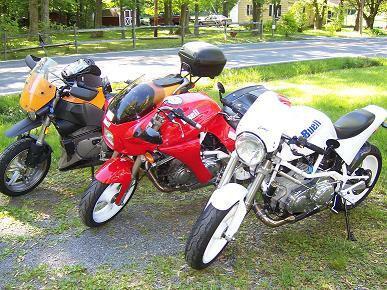 Why I do/don't ride a Buell: Because I (still) can. Despite my efforts to the contrary. How can Buell improve their motorcycles? : Keep the faith. Life History/Philosophy: Have fun, ride fast, don't wanna limp away (does a helicopter ride count? ).